Our Personalized Wedding Handkerchiefs make wonderful personalized gift for any member of your family or wedding party. 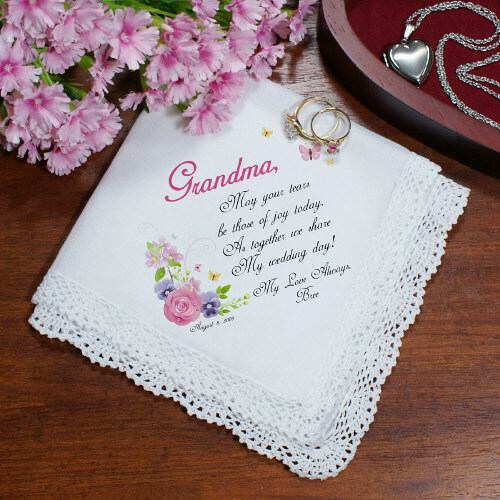 This joyous occasion may cause for a few tears to be shed, prepare your Mom, Grandmother or favorite Aunt with their own Personalized Ladies Handkerchief.Our Personalized Wedding Handkerchiefs are available on our 13"square Crochet Lace handkerchief. Soft to the touch. Machine Washable. Includes FREE Personalization! Personalize your Wedding Handkerchief with any name or title, the Bride or Groom's name and wedding date. 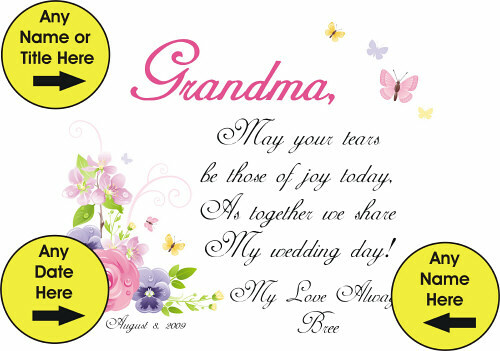 It is so beautiful and will touch the heart of my son's last remaining grandparent on the first wedding of a grandchild for his grandmother. Personalized Bridal Party & Wedding Party Gifts will make your wedding party the best ever with custom printed personalized wedding bridal gifts. These custom wedding bridal party gift ideas are perfect for the rehearsal dinner, bridal party and the honeymoon. Also makes a great gift for the Mother and Father of the Bride or Groom. Don't forget about the flower girl and ring bearer. Many custom personalized wedding bridal party gift ideas are available for everyone on your personalized wedding gift list.